Faced with our last night in London, it was time to get serious about what we wanted to do. Being unable to function without eating, we headed to a local pub for fish and chips. Since it was tea time when we arrived, we were the only ones there. Our waiter was from Hungary and very chatty. He apologized to us for the weather and couldn’t believe it when we explained that living in Southern California, we get tired of sun all the time. He assumed I wanted white wine with my fish – um, wrong. I managed to get him to bring me a beer and we had a very nice meal. 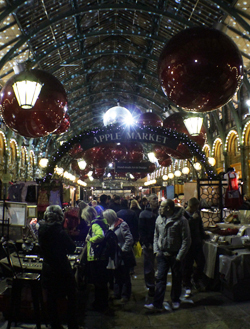 Once fortified, we headed off to Covent Garden to shop the markets. 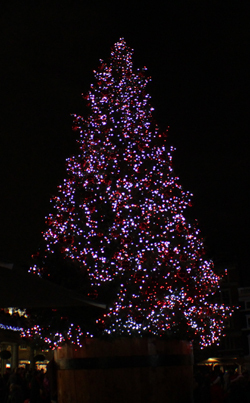 It was beautifully decorated for Christmas and full of activity even though it was raining and near closing time. 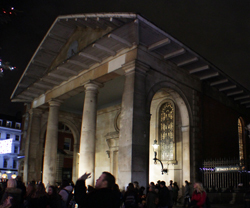 The area has a rich history with performers and artists and is home to the Royal Opera and St. Paul’s (the actor’s church). 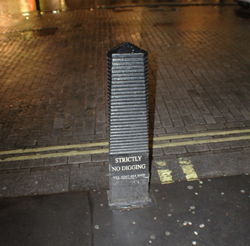 It is said that the first British performance of Punch and Judy took place here in 1622. 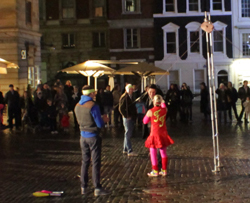 The night we were there, we saw street performers ranging from opera singers to break dancers. Hubby’s favorite was an acrobat who also told jokes as she performed. We were able to shop the various markets and buy some Christmas presents. I had been looking all trip for a ring for myself and finally, I found one! There was a vendor selling sterling silver rings and I immediately fell in love with a square one. I put it on and haven’t taken it off since. 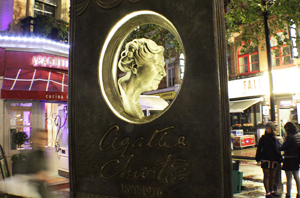 As the markets closed for the night, we again wandered back towards the hotel to make the most of our remaining time. 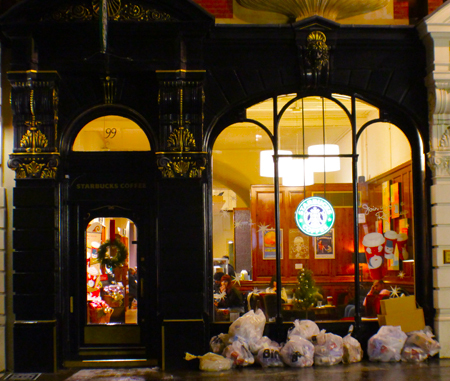 I don’t think Starbucks in the US would get much business if they piled their garbage outside every night, but in London, everyone does it. Go figure. Piccadilly Circus is pretty gaudy and held no appeal for us. 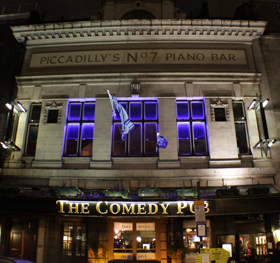 I think the Piccadilly Piano Bar and Comedy Pub may make the list for next time….Sounds intriguing! London Chronicles #25: The American Church in London London Chronicles #27: A Morning with the Royals!